For the money you still can’t beat Subaru, And their loyal customers relish the fact that they don’t have to go into debt to buy one. In fact, Kelly Blue Book, which has been in the car evaluation business since 1926, recently bestowed the following exemplary awards on Subaru: Most Trusted Brand, Best Overall Brand and Lowest Cost to Own. 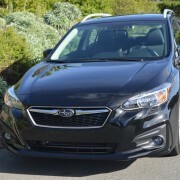 Subaru has developed a following of loyal enthusiasts eager to share their positive experiences with others. I had just finished photographing this Brilliant Brown Pearl Outback when I was accosted by a Subaru-owning neighbor dying to get a look at the new-for-2017 Touring version of the Outback. Here’s another 2016 model you can probably wangle a good deal on at your Subaru dealer. The current Crosstrek, which is a customized derivative of the Imprezza line, is about to be supplanted with an all new model for 2017. Subaru pioneered the crossover SUV with the original Forrester. The 2016 model marks the fourth revision of that first model. This 3,370 pound mini SUV retails for $28,795 in Limited trim. Although Subaru (BRZ) and Toyota (Scion FRS) have collaborated from the outset to produce slightly different versions of the same 2+2 sports coupe, there are some notable differences that differentiate the pair. For 2016, Subaru has taken pains to upgrade the look of their BRZ. Subaru has always been known for its idiosyncratic vehicles, from the humorous Brat mini pickup with seating for 2 in the bed, to the other-worldly SVX coupe with fixed side windows and doors extending well into the roof. As always, Subaru designers put more of a premium on functionality than beauty. In Series Blue trim, a new level of cosmetic refinement for 2015, the BRZ decidedly outshines its Toyota counterpart. The BRZ shares basic architecture with the FRS: rear wheel drive (first ever for Subaru), 2.0 liter flat four cylinder engine producing 200hp, independent suspension and disc brakes at all four corners. Life is thus easy with Outback. It’s faster than you think, more nimble than it looks, yet still every bit as practical and affordable as you’ve come to expect from Subaru. For 2015, this dependable companion has gotten better without getting bigger, and faster without getting thirstier. With a static ride height of 8.7 inches, all wheel drive, and nubby Yokohama Geolander tires (225/55R17), the Crosstrek is a legitimate off road tool, eminently well suited to outback forays, winter endeavors, and expeditions to the supermarket. Its appeal lies in its consummate practicality, standard all wheel drive traction, spunky pancake 4 engine, new CVT drive train, and above all, its unsurpassed interior spaciousness. If all that isn’t worth a relatively modest investment of $33,220, good luck bettering this combo elsewhere. The latest incarnation of the Impreza WRX makes so much sense on so many levels that it’s hard to believe you only need to shell out $28,995 to buy the leather-shod Limited model.